Although the ancient Silk Road no longer functions, retracing parts of its route offers travelers a historical and cultural adventure. The Silk Road passes through many landscapes, including deserts, grasslands and mountains. The Silk Road was functioning across Eurasia as early as the 2nd century BC. By the time Marco Polo arrived in China in the 13th century, the Silk Road had seen its grander days. And, it would be disappearing three centuries later when the newly established sea cargo routes were safer, faster and cheaper than caravan shipping. 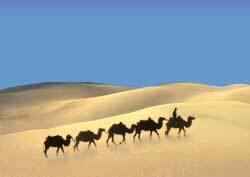 No one actually traveled the length of the Silk Road. Instead, traders specialized in working short segments of the route near their home bases. Over the course of a product's journey between East and West, it could change hands dozens of times. Think of a long chain, with the traders being the links. China exchanged goods like silk and furs for valuables like gold and jade.